Cable is dead. So what are Domino, Cannonball, Shatterstar, Boom Boom, and Warpath gonna do about it? They're reassembling the original X-FORCE. On December 26, writer Ed Brisson and artist Dylan Burnett team up for a new ongoing series that reunites the squad...for vengeance. The mutants rise from the ashes of EXTERMINATION to hunt down Cable's killer, but when their target is the time-traveling younger version of their fallen leader, is there a line they absolutely cannot cross? And what does Deathlok have to do with it all? Get ready for a reckoning in this all-new, high-octane mutant adventure when X-FORCE returns! "Within the Marvel Universe, the X-Men have always been the outsiders, the black sheep. And X-Force are the outsiders within the X-Men. They're the team willing to do the things that no one else in the Marvel Universe will and that's something that appeals to my sensibilities a great deal," explains Brisson, the mastermind behind the death and devastation happening in EXTERMINATION. "Right now we have a couple of different things going on with X-Force. 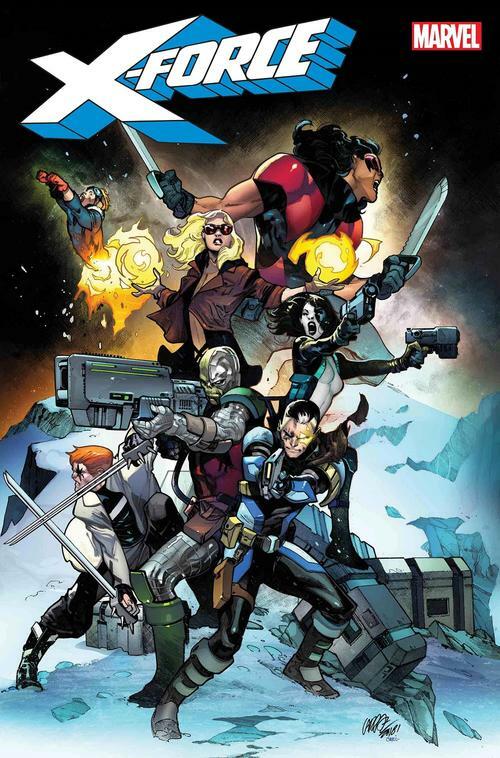 Coming out of EXTERMINATION, Domino, Shatterstar, Cannonball, and Warpath are reeling from the loss of their mentor and have unanswered questions. They're on the hunt for this new Kid Cable to get those answers—some want his head, some just want to talk to him to find out what the hell is going on. Is this really their Cable? Is this an impostor? "We're going to learn more about Kid Cable and establish what sets him apart for the Cable that people know. We're going to get into his history and have some really exciting stories cooking with a laundry list of X-Force villains." The writer concludes, "There are layers to be peeled back, but nothing is what it initially seems." or Brisson and Burnett, telling this story is a landmark moment for them as creators—and as X-fans. "X-force has always been the one X-team that stood out the most for me," says Burnett. "A lot of my favorite mutants have belonged to it over the years (namely Cable and Psylocke) but being able to bring back the original lineup in a new way is a huge honor. They're just a bunch of badasses. It's dope. I'm stoked." Brisson agrees, "When X-Force first launched back in the '90s, I was there, at the comic shop first thing on release day. I'd been reading NEW MUTANTS up until at that point and was a massive fan. X-FORCE was mind-blowing to 16 year-old me. There was something about seeing the New Mutants, students at the time, 'graduating' into their own team. It's something that doesn't happen often with X-kids." And that longstanding love for X-FORCE is matched by a homegrown creative team, too: "Dylan and I have known each other for a few years and have been talking about working together for a while. We're actually both originally from the same city—Oshawa, Ontario." Now these two X-fans are graduating to a legendary mutant team of their own. Coming this December, read X-FORCE #1 by Ed Brisson and Dylan Burnett! FORCE #1 cover by Pepe Larraz.